Vending machines used to be a pretty simple affair: you put some coins in, and food or drink that in all likelihood isn’t fit for human consumption comes out. But like everything else today, they are becoming increasingly complex Internet connected devices. Forget fishing around for pocket change; the Coke machine at the mall more often than not has a credit card terminal and a 30 inch touch screen display to better facilitate dispensing cans of chilled sugar water. Of course, increased complexity almost always goes hand in hand with increased vulnerability. So when [Matteo Pisani] recently came across a vending machine that offered users the ability to pay from an application on their phone, he immediately got to wondering if the system could be compromised. After all, how much thought would be put into the security of a machine that basically sells flavored water? The answer, perhaps not surprisingly, is very little. The write-up [Matteo] has put together is an outstanding case study in hacking Android applications, from pulling the .apk package off the phone to decompiling it into its principal components with programs like apktool and jadx. He even shows how you can reassemble the package and get it suitable for reinstallation on your device after fiddling around with the source code. If you’ve ever wanted a crash course on taking a peek inside of Android programs, this is a great resource. By snooping around in the source code, [Matteo] was able to discover not only the location of the encrypted database that serves as the “wallet” for the user, but the routine that generates the encryption key. To cut a long story short, the program simply uses the phone’s IMEI as the key to get into the database. With that in hand, he was able to get into the wallet and give himself a nice stack of “coins” for the next time he hit the vending machines. 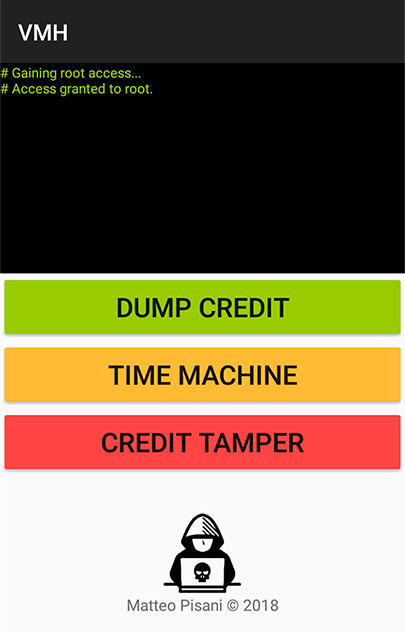 Given his new-found knowledge of how the system works, he even came up with a separate Android app that allows adding credit to the user’s account on a rooted device. In the video after the break, [Matteo] demonstrates his program by buying a soda and then bumping his credit back up to buy another. He ends his write-up by saying that he has reported his findings to the company that manufacturers the vending machines, but no word on what (if any) changes they plan on making. At the end of the day, you have to wonder what the cost-befit analysis looks like for a full security overhaul when when you’re only selling sodas and bags of chips. When he isn’t liberating carbonated beverages from their capitalistic prisons, he’s freeing peripherals from their arbitrary OS limitations. We’re starting to get a good idea about what makes this guy tick. Moonpig is a well-known greeting card company in the UK. You can use their services to send personalized greeting cards to your friends and family. [Paul] decided to do some digging around and discovered a few security vulnerabilities between the Moonpig Android app and their API. First of all, [Paul] noticed that the system was using basic authentication. This is not ideal, but the company was at least using SSL encryption to protect the customer credentials. After decoding the authentication header, [Paul] noticed something strange. The username and password being sent with each request were not his own credentials. His customer ID was there, but the actual credentials were wrong. [Paul] created a new account and found that the credentials were the same. By modifying the customer ID in the HTTP request of his second account, he was able to trick the website into spitting out all of the saved address information of his first account. This meant that there was essentially no authentication at all. Any user could impersonate another user. Pulling address information may not sound like a big deal, but [Paul] claims that every API request was like this. This meant that you could go as far as placing orders under other customer accounts without their consent. [Paul] used Moonpig’s API help files to locate more interesting methods. One that stood out to him was the GetCreditCardDetails method. [Paul] gave it a shot, and sure enough the system dumped out credit card details including the last four digits of the card, expiration date, and the name associated with the card. It may not be full card numbers but this is still obviously a pretty big problem that would be fixed immediately… right? [Paul] disclosed the vulnerability responsibly to Moonpig in August 2013. Moonpig responded by saying the problem was due to legacy code and it would be fixed promptly. A year later, [Paul] followed up with Moonpig. He was told it should be resolved before Christmas. On January 5, 2015, the vulnerability was still not resolved. [Paul] decided that enough was enough, and he might as well just publish his findings online to help press the issue. It seems to have worked. Moonpig has since disabled its API and released a statement via Twitter claiming that, “all password and payment information is and has always been safe”. That’s great and all, but it would mean a bit more if the passwords actually mattered.